Vinnies volunteers: Beverley Moore (right) and her husband Brian are with some of their friends who volunteer at the St Vincent de Paul Society store in Killarney (from left) Elaine Mauch, Megan Ballard and Shirley Ballard. BEVERLEY Moore has spent much of her life helping complete strangers through the tough times, and she knows what it’s like to have others stand by her through her own struggles. As a long-time member of the St Vincent de Paul Society, she’s had her Vinnies “family” by her side for her two major battles – the first when her youngest son’s life was slipping away and the second during her own fight with cancer. Her Vinnies friends were there for Beverley, her husband Brian and their five sons both times, and she will never forget that. The St Vincent de Paul Society recently honoured Beverley with a special presentation for her 50 years of service to the organisation in various parts of Queensland. 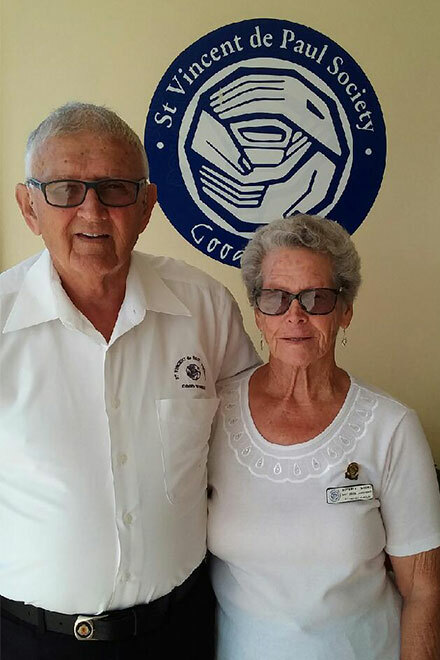 Brian, a former state president of Vinnies, was by her side when members paid tribute to Beverley during the presentation at Killarney, in the Southern Downs of Queensland. Killarney is the latest town where the Moores have volunteered as servants of the poor and needy. For Beverley, it all started at Dirranbandi, in outback southern Queensland, when she followed Brian into the Vinnies fold. They were a young couple and Brian had been posted there as a Queensland ambulance officer. As strangers in those parts, they were keen to get involved in the community and make new friends. Beverley said her involvement with Vinnies came about almost by chance. “Brian joined the St Vincent de Paul Society in Dirranbandi and Fr Bennett was there at the time, and somehow we got talking about a (Vinnies) shop and we decided to give it a try,” she said. “The other churches had tables in their halls and things like that (but no shop) and we all helped each other out, if we had no clothes (to offer). Poverty in the town was most evident among Aboriginal people. “The Aboriginal people were pretty poor, and they were living on the side of the river and in little shacks,” Beverley said. Brian said people were struggling because wages were low and the cost of living higher there than in Brisbane or the large regional towns. “And Beverley and the ladies out there, they had people just coming in looking for clothes that they couldn’t afford to pay top price for,” he said. Beverley said moving to a remote country town like Dirranbandi as someone so young and naive was “a great learning curve”. “But, I suppose it strengthened me to carry on my work from there, because when you went there you joined everything,” she said. “And Beverley used to be secretary of the ladies’ ambulance committee as well,” Brian said. “I’d never been on a committee in my life,” Beverley said. That woman and the friends she made through the St Vincent de Paul Society were the ones who stood by her and Brian when crisis struck. Their youngest son Russell, then five years old, became seriously ill.
“One lung had collapsed on one side and the fluid was pushing the heart and would’ve collapsed the other lung,” Brian said. A doctor in Dirranbandi urged them to take Russell straight to the Mater Hospital in Brisbane. “It was a good job we did (take him to Brisbane) – we would’ve lost Russell earlier, but we didn’t lose him in the finish, because it was divine intervention that he’s still alive,” Brian said. Russell was diagnosed with cancer of the lung and the news worsened when the specialist spoke to Brian and Beverley on their fifth day in Brisbane. “He said, ‘I want to prepare you now … Your son’s got six months to live’,” Brian said. “Of course, we were devastated. “After we found that out, we went straight out and we stopped off at the church at Enoggera and just prayed to Our Lady and Our Lord to spare Russell. “And, by gee, he was spared. He had chemotherapy and radium treatment, and he’s still alive, almost 50 years later. That whole experience has deepened Beverley’s faith, and highlighted the unwavering support of her Vinnies friends and others in the Dirranbandi community. “We had very good friends out in Dirranbandi who helped look after the kids when Brian had to be down (in Brisbane) with me,” she said. Vinnies friends were there again when Beverley had a battle with breast cancer a few years ago. She was co-ordinator of the volunteers at the Killarney Vinnies store at the time, and they stepped up to shoulder the load and rally around her in support. “They were very good. Good friends …,” she said. 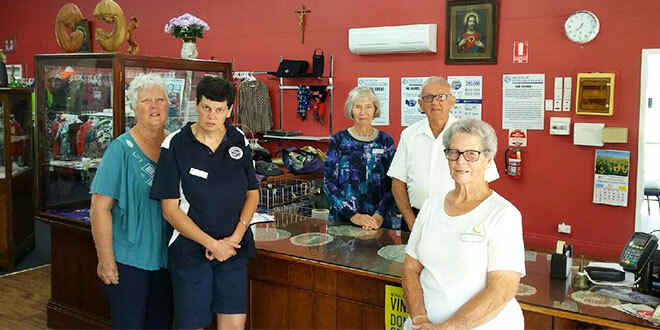 Beverley has set up and run Vinnies shops in Dirranbandi, Beaudesert and Killarney, and as a Vincentian has been a conference member, conference president and regional president. And what are the memories that stand out over that 50 years of experience? “I think how kind my (fellow Vinnies volunteers have been) … how kind people were to us when we had Russell’s (health scare) … and over the years … and then of course when I got sick …,” Beverley said. She said the friendship she’d had from her co-workers had given her most satisfaction. “And you go home thinking that you’ve done something good for the poor or the needy … at the end of the day,” she said.